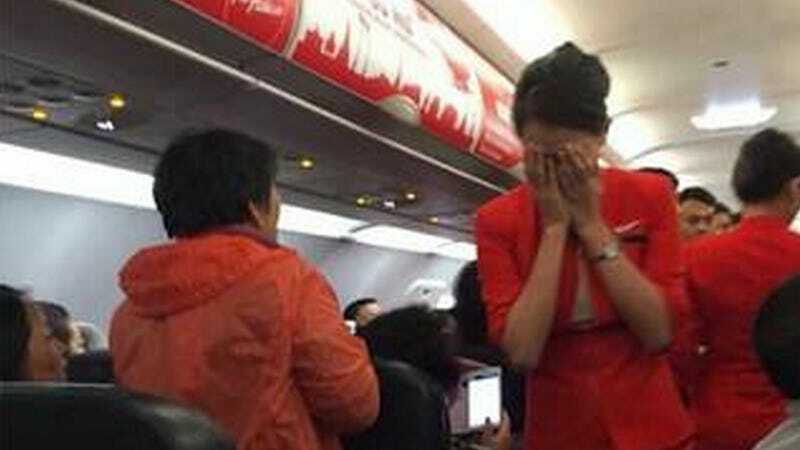 Flights get interrupted fairly frequently by the vulgar drunk, the groping drunk, and even rage over the Knee Defender — but a Chinese couple forced a plane to turn back when they allegedly attacked a flight attendant with scalding hot water, then threatened to blow up the plane. Supposedly, the whole ordeal began when the 20-something couple discovered that they were not sitting together on the plane, because they were with a tour group, and were assigned tickets alphabetically. A flight attendant helped them get seats together, after they called attention to themselves by being loud and disturbing. As reported by thenanfang, the incident happened on Air Asia flight 9101 from Bangkok to Nanjing, China. After being seated together, a woman bought a bowl of instant noodles and asked for boiling water. The passenger then expressed her gratitude by reportedly tossing the hot water on a flight attendant. The woman's male partner then allegedly threatened to blow up the plane, and the woman threatened to kill herself. Another report says they threatened to jump out of the plane. Other passengers intervened to restrain the couple, who were arrested once the plane returned to Bangkok.